The power of the storefront window is well known in retail circles, but with the influx of e-commerce, it’s now more important than ever. But when you’re overrun with the daily demands of a running a small business, finding time to create visually stimulating window and in-store displays can be challenging. So we enlisted the help of Natalie Coulter, director Belle Flaneur], to get your creative juices flowing and think outside the box. Belle Flaneur is a sustainable art studio turning repurposed materials diverted from the waste stream into works of art for local fashion retailers, educating the public on waste minimisation in the process. Since 2011, Natalie and her team have worked with a varied client list including luxury retailer, Robby Ingham to create innovative, edgy, thought-provoking and fun VM. Their strong commitment to sustainability celebrates the creative reuse of waste materials. To discover more on Natalie and Belle Flaneur, read our interview HERE. 1. Create constant interest in the window by way of a changing display and product regularly. As people get to know your window changes they will enjoy the experience of looking in to see the change and what’s new in-store. Treat the window like your own bulletin board or news of the week! Reused materials are cost-effective, smart and show you care about the environment, so they’re super cool. 3. Create quirky displays in store, on shelves and around the space using objects and materials that are not for sale. This give your customer something else to look at. Have your concept for the windows travel through the store and connect the theme to the other landing or display places -shelving, display cases etc. 4. Invest in some good props or objects of interest that connect to your store image & from time to time move them to different positions in the store. Your regular customer will get a kick out of seeing your collection of props move to different places in the store. I personally love visiting Anthropologie in NYC (flat iron district) and seeing what and how they have reused a permanent birdcage prop. I find it funny and inspiring to see this `item of interest’ filled with product like jewellery or plates, anything but a bird. 5. Use alternative objects for displaying merchandise. Home furniture can work a dream! Think tables, stools, ladders, collections of jars, bottles, plates, trays, surfboard, sewing machine etc. in a second set of tables or such and alternate the home ones and the store ones for some differentiation. 6. Collaborate with you local community and promote initiatives and events. Celebrate holidays and festival happenings. It will connect you with your local area. Such things as fun runs, creatively hang their promotional material in your windows and through the store. Be a local supporter and get out on the street to cheer the runners on! 7. Keep the hangers spaced and don’t cram too much stock on each rack. Organisation is easy on the eye and offers a more pleasant shopping experience. Keep visual clutter in your store to a minimum, starting with the hangers all facing the same way and spaced evenly. 8. Create a visual interest at the back of the store by way of strong colour blocking, a wall hanging or an installation. It will draw the customer in and down to the back of the shop. But is also engages the customer and shows you care enough about your store and the customer experience to light the back end well and create drama down in the back of the store. 9. 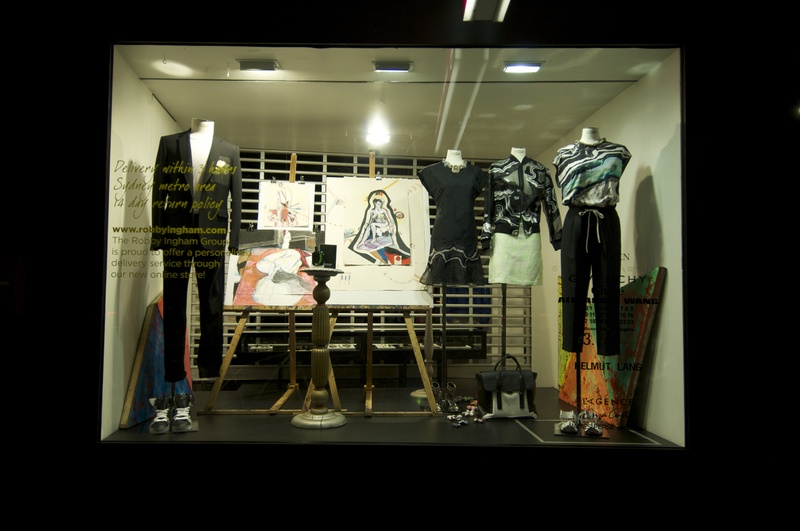 Collaborate with artists and showcase their work in your store! It’s a win win for all parties. Recently, I collaborated with a local Sydney artist, Madeline Luschwitz. Collaborating with emerging artists is a new initiative for me in my concepts, that is to celebrate an artist, showcase their work by incorporating their art in my installations. At the Robby Ingham store I peppered Madeline’s artwork through the store starting with the windows. The customers loved it. 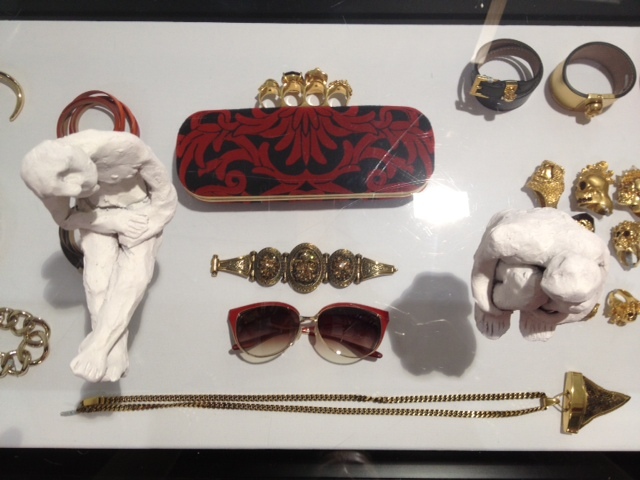 I placed the ceramic figures by the artist on the jewellery cases as seen here with Comme de Garçon wallets and jewellery by Alexander McQueen and Givenchy. I just adore the positions and the nakedness of them adds humour. Haven’t we all been in these human positions? I particularly love the one face down ‘planking’ lol. But the ceramic figures moved throughout the space. They also spent some time luxuriating with the designer bags by Stella McCartney and Alexander Wang. In addition we stacked the store shelves with the artists collage and drawings. I layered all her art on props that I sourced to support her work- blank canvas’s, easels, frames, wooden boxes. 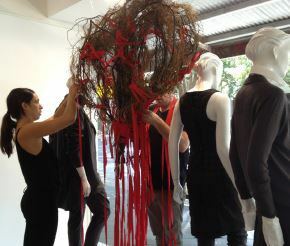 For this installation the store became more of an art gallery. 10. Have fun in your retail space. Take Visual Merchandising and display risks. See what feedback you get, look forward to the feedback, bring it on! Don’t be disheartened if you don’t nail it every time. There is always next week to change it up again. Play! Tags: Anthropologie, Belle Flaneur, Natalie Coulter, Robby Ingham, top tips, visual merchandising, vm. Bookmark the permalink.